Little Arrows is committed to providing quality care for infants, helping them develop physically, mentally, socially and emotionally. Physically, your child will practice sitting up and walking. Mentally, your child will have books read to him/her and songs sung. Socially, they will participate in clapping hands, waving and imitating other infants. Emotionally, they will be comforted when upset. They will engage in play time and build trust by playing games. We at Little Arrows understand how hard it is for you to leave your special little one each morning. That’s why we’ve worked diligently to create a comfortable setting for your baby. We provide an environment in which he or she will receive personal attention and love. 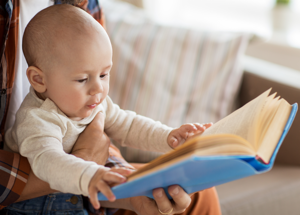 Our Infant Program focuses on activities that help infants learn more about themselves, other people, and the world. In addition to standard care – sleeping, feeding, and diapering – babies are lovingly held for special one-on-one time to build affection and trust. Language development is encouraged by the caregiver’s responses to the baby’s sounds. Your infant will have play time with toys to help develop physical skills as well as encourage social interaction with other infants. We recognize your need to stay informed about your baby’s developmental progress. So, before your baby starts at Little Arrows, we’ll sit down with you to discuss your baby’s home schedule. That way, we can provide a similar schedule – one that’s comfortable for your baby. You can also expect our caregivers to provide you with a record of your infant’s daily activities at the end of each day. This “Baby Gram” will provide you with a complete record of your baby’s day, including activities, feeding and napping schedule. To care for babies properly, we’ve learned to do a lot of listening because each little baby is different. Each little look and cry has a special message. But over the years, we’ve learned that a baby’s basic needs are always the same. Love, Warmth, Tenderness.